December Woodworking Poll: Does Paint Belong on Fine Furniture? Fresh on the heels of the question in November’s Poll, “Does plywood belong in fine furniture?” I was faced with the question of whether paint is appropriate thereon. Paint is on my mind these days, as I paint the front door of our home. 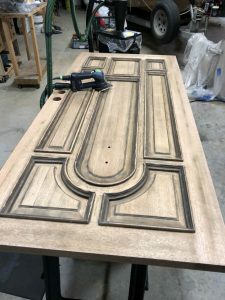 Now, no one is going to look at this door closely enough to necessitate a fine-furniture finish, paint or otherwise, but I’ll be trying out Shannon’s technique on the next project I paint. There was nothing to do but take this door down to the wood before applying primer and then white paint. The Festool RO90, with its 3″ round, and Delta pads, was indispensable in minimizing the amount of hand sanding required. 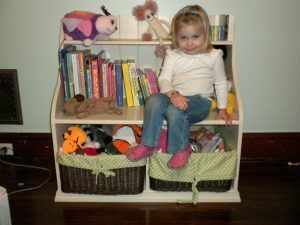 I would have used Shannon’s steps on the storage project for our youngest granddaughter. I made this project from poplar, and it painted up nicely. Next time I see Audrey I’ll have to ask her if she thinks this painted chest qualifies as fine furniture. She seems to like it. Paint is for anyone who uses paint. The better the the paint, and the better it’s applied, the better the product. If you will notice some of the finest oriental furniture is painted. Done right, paint makes the piece. Hard to beat a quality lacquer finish no matter the color.